"Never give advice unless you are asked for it". There lived a group of monkeys in the mountains. During one winter, there were heavy rains. Drenched in the rain, they began to shiver in the cold. 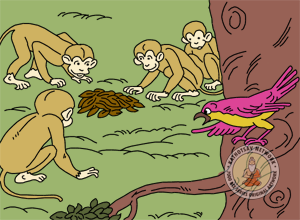 During this time, some of the monkey found some colourful Gunja fruits, which appeared to them as embers of fire. Hoping to make some fire for themselves, they began to blow at them. A bird on a nearby tree was watching the monkeys from above. Considering the vain attempts the monkeys were busy with, it thought of advising them against it, "What big fools you are. You are blowing at some Gunja fruits and not embers of fire. You will never be able to make any fire out of them." "What you are doing is a waste of time. These fruits will not help you to protect yourself against the cold. Go and find some shelter instead. You may find a cave or a burrow where you will be protected from the rains and the cold winds." The monkeys did not like his advice. One of the old monkeys said, "Go fool yourself. Why are you interfering in our task?" But the bird disagreed. 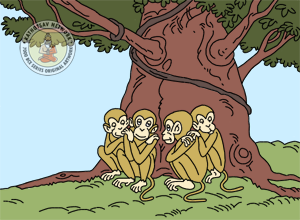 Not heeding what the old monkey had said, it flew down from the tree and persisted that the monkeys stop what they were doing. 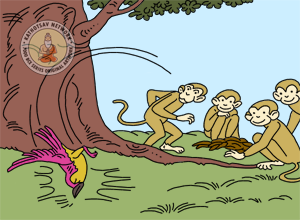 The monkey ignored his chatter but the bird refused to stop. In an effort to convince the monkeys, the bird came close to explain that their efforts were useless. Already frustrated by their vain efforts, the monkeys became furious. One of the monkeys caught hold of the bird and smashed him against the ground. The bird was severely wounded. Never give advice unless you are asked for it.